Pav bhaji recipe - Pav bhaji is a famous street food of Mumbai or Bombay. It is a common scene that several carts are serving pav bhaji on streets and beach. Now it is a popular fast food in all parts of India. 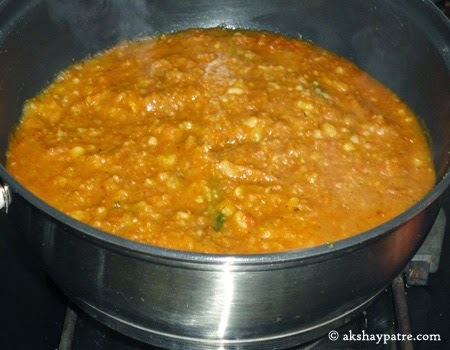 For the preparation of this bhaji, I have used MTR pav bhaji masala which is readily available in the shop. This potato based bhaji has a special taste and texture. Besides potatoes, other vegetables like cauliflower, green peas and capsicums are used to make it more healthier and tasty. 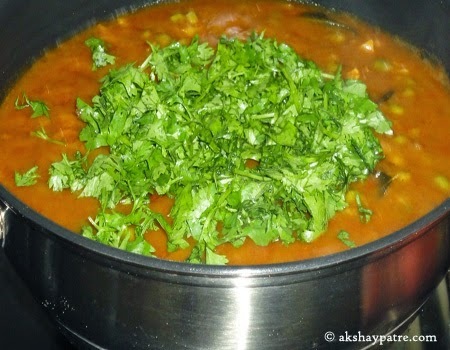 This bhaji is usually served with pavs or bread slices. Now a days pav bhaji has become staple food of many homes. 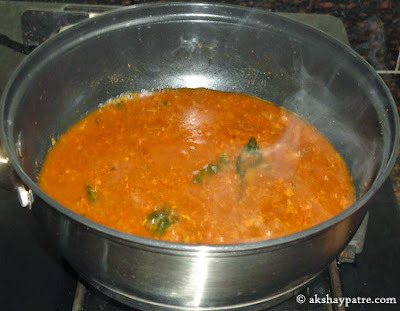 Making pav bhaji with easily available masala is not a big task. 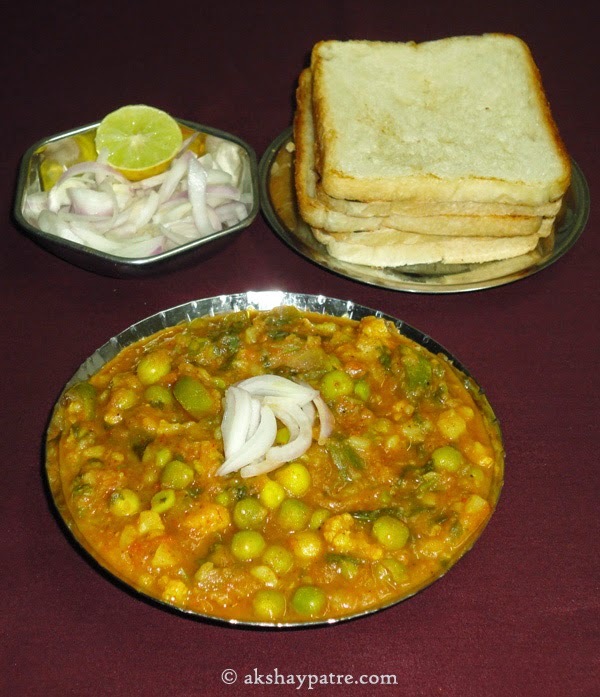 Pavs especially prepared for this pav bhaji is available at any time in bakery shop. 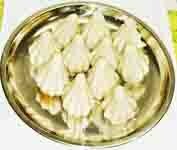 It is a full meal itself and you don't even need to prepare any other staple food like chapathi, sabzi, rice etc. This is a versatile dish served in parties, breakfast, lunch and dinner. You will get pav bhaji out side of schools, offices and parks. I have used bread slices in the place of pav. To make a use of already available bread slices, I have not bough the pavs. Like pavs, bread slices are also shallow fried in butter. Wash the green peas, capsicums and cauliflower florets separately. Cut the capsicum into two halves. Remove the seeds and chop it into small pieces. Heat 3 cups of water in a deep vessel and boil the cauliflower, capsicums and green peas until soft. Wash and peel the potato. Cut it into large cubes and steam it till soft. 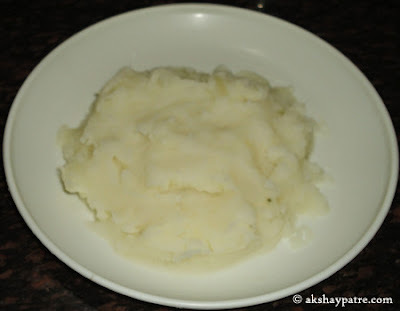 Mash the steamed potatoes and keep it aside. Once the onions become translucent, add the grated tomatoes. 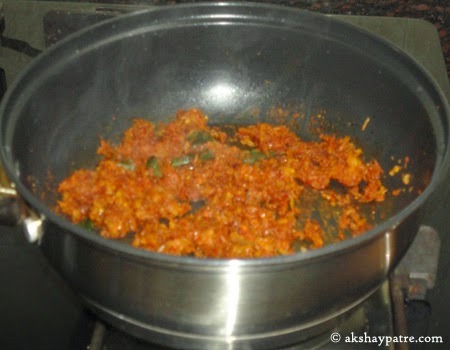 Add the pavbhaji masala, chilli powder, coriander powder, jeera powder and haldi powder to the onion tomato mixture. Saute for 2 minutes on low flame. Prevent it from burning. Add 2 cups of vegetable stock and salt, stir to combine. Add the boiled green peas, capsicums and cauliflower. Stir well and bring it to boil. 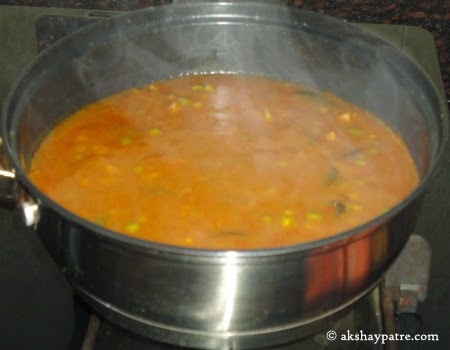 Further, simmer till you get the desired consistency. Add the chopped cilantro and mix well. Remove from the flame. Squeeze the ½ lime in the bhaaji and mix well. While serving, thinly slice the onions and squeeze the ½ lime on it and sprinkle salt. Garnish pav bhaaji with this onions. 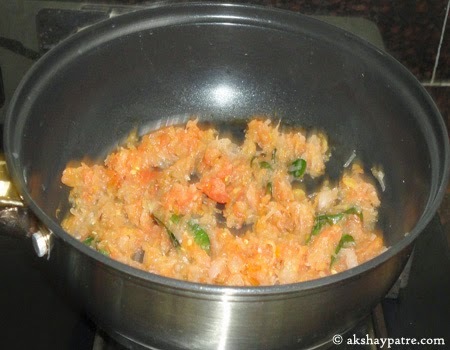 If you are using pav with pav bhaji, slit the pav and apply butter to it. Heat a griddle and roast the pav till golden colour from all sides and serve hot with pav bhaji. If you are using bread slices, apply butter to the slices and roast them on a griddle for few minutes and serve hot with bhaaji. Pav bhaji tastes great with both pav and bread slices. 1. 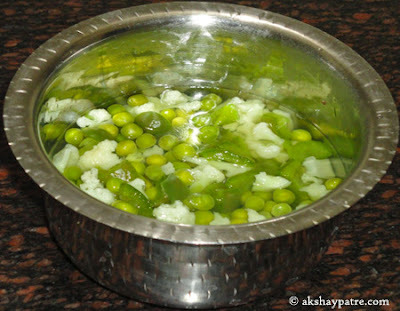 Wash the green peas, capsicums and cauliflower florets separately. Cut the capsicum into two halves. Remove the seeds and chop it into small pieces. Heat 3 cups of water in a deep vessel and boil the cauliflower, capsicums and green peas until soft. 2. Wash and peel the potato. Cut it into large cubes and steam it till soft. 4. Once the onions become translucent, add the grated tomatoes. 5. Cook covered till the tomatoes become soft. 6. 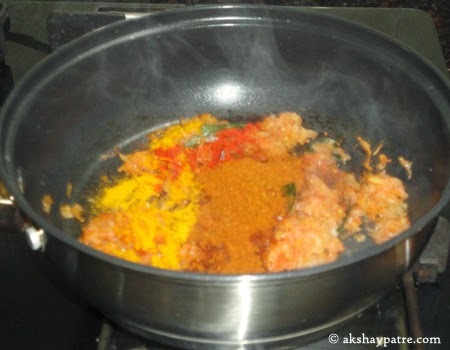 Add the pavbhaji masala, chilli powder, coriander powder, jeera powder and haldi powder to the onion tomato mixture. 7. Saute for 2 minutes on low flame. Prevent it from burning. 8. Add 2 cups of vegetable stock and salt, stir to combine. 9. Add the mashed potatoes and mix well. 10. 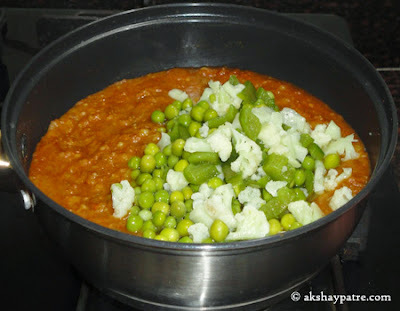 Add the boiled green peas, capsicums and cauliflower. 11. Stir well and bring it to boil. Further, simmer till you get the desired consistency. 12. Add the chopped cilantro and mix well. Remove from the flame. Squeeze the ½ lime in the bhaaji and mix well. 13. While serving, thinly slice the onions and squeeze the ½ lime on it and sprinkle salt. 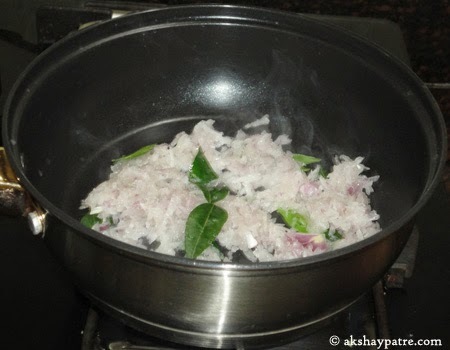 Garnish bhaaji with this onions. If you are using pav with pav bhaji, slit the pav and apply butter to it. Heat a griddle and roast the pav till golden colour from all sides and serve hot with pav bhaji. If you are using bread slices, apply butter to the slices and roast them on a griddle for few minutes and serve hot with bhaaji. 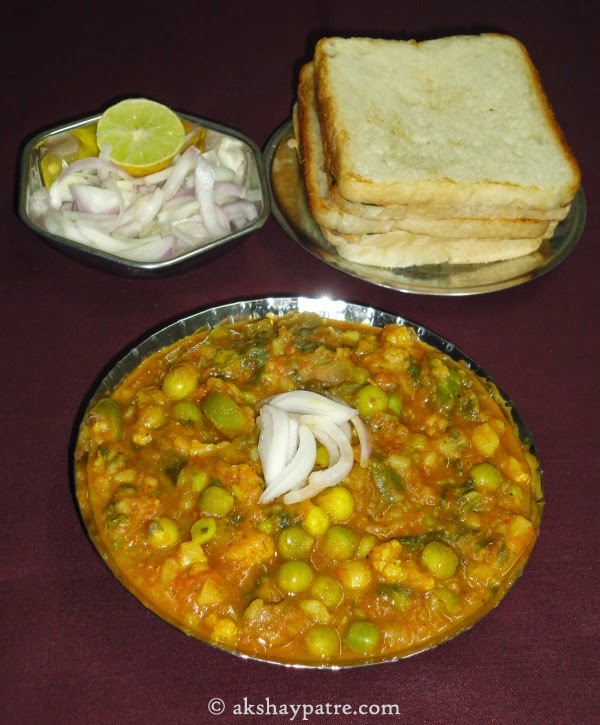 Pav bhaji tastes great with both pav and bread slices. 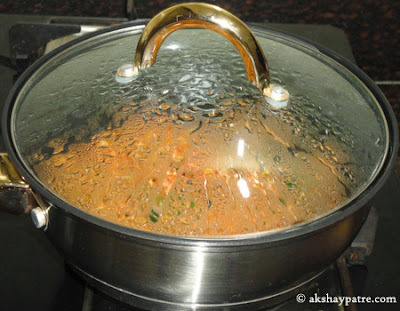 My husband loves pav bhaji and I never got it right. This is a must try!